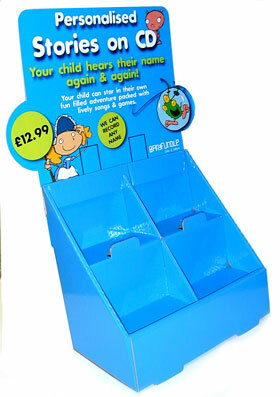 This Unit is Made from B-Flute Corrugated Cardboard with Digitaly Printed Header. The Base unit colour is applied by laminating a blue vinyl. Header can be cut to any shape required by using a supplied cutter guide in electronic format. 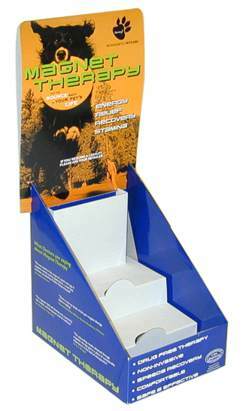 This display is designed to be produced in E-Flute corrugated board and will hold approximately 15 CDs or greeting card packs. It comes flat and is easy to assemble. This version is supplied in solid board approx 600 Mic thick and folds over to give extra strength a corrugated insert can be inserted to hold items such as CD's in crystal cases. We have a standard cutters for this design with following dimensions. 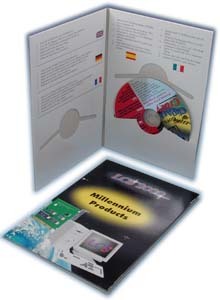 Simple booklet style folder which has apertures cut to hold CDs and booklet overall size when folded is A5 Card is 400 Micron folded to make 800 micron so it has a stiff quality feel. We can remove the inner CD slots to just 1 or 2 CDs if you want. Add this page to your Favourites!